Well on her way to becoming one of Chicago's premiere Salon Owner/Stylist Deanna Williams (Ms Dee) is setting the standard for over all healthy hair care. Living by the motto “To Look Good is to Feel Good, she makes sure to go the extra mile to listen, retain, and nurture each individual client. This passion with the beauty industry begin at the age 13. Ms Dee realized after observing one of her mothers friends as she braided hair, “hey I can do that”! Ms Dee finally took her destiny into her own hands. After years in corporate America she decided to attend Truman Colleges Cosmetology program, where she completed advanced training in cosmetology. Once Ms Dee was licensed, she benefited from additional training in the area of Blow-Drying,Coloring, and Smoothing out hair without the assistance of chemicals. After much soul searching and prayer, RelaxShesNatural™ Hair Studio was born. It is the purest example of when your God given gifts meet destiny. It's one of the most diverse natural hair salons in the world. Ms Dee is always looking for ways to cultivate the beauty industry by attending workshops, seminars, and training from world renown stylist. 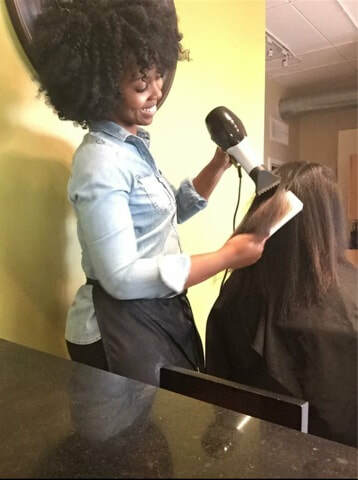 RelaxShesNatural™ is home to some of Chicago’s most talented stylist! Conveniently located 5 minutes outside of Downtown it has a relaxing professional atmosphere. Make sure you pay a visit to the salon known for having the “Best Silk Press In The Mid West!